"Making life better for pets and their people!" 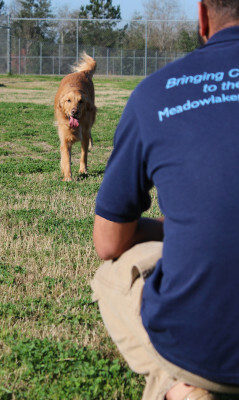 Working at Meadowlake Pet Resort & Training Center means being a part of an exemplary team of animal lovers. Together we provide our guest with the best care, attention, and fun of any pet resort in Houston. Join our team and join the pack! Here, we have fun learning, playing, and growing together! Below are positions for which we regularly accept applications. If you are interested in applying please fill out the Application for Employment here. The activity counselor is primarily responsible to insure that all purchased activities are delivered to the guests, and all cats and dogs receive a quality activity experience. This position will also assist lodging operations if needed and time permits. The Lodging Technicians are responsible for the day-to-day care of all boarding pets (cats and dogs), and have a major impact on the quality of a pet's stay at Meadowlake Pet Resort & Training Center. It is imperative that the Lodging Technician be comfortable with and passionate about the animals in his or her care. During all interactions with pets at Meadowlake, Lodging Technicians must treat all pets with loving care and be aware of their individual needs. Responsibilities include walking dogs on leash to and from potty yards, scooping all stools and recording elimination habits, sanitizing and cleaning pet rooms, providing clean and full water bowls to all pets at all times, interacting and playing with pets in a positive manner during scheduled activities and more. The Daycare Counselors are responsible for maintaining the health, safety and comfort of pets attending Daycare at Meadowlake Pet Resort & Training Center. Responsibilities include engaging in play activities with dogs such as fetch, supervising play behavior of the group and monitoring for potential conflicts or escalation, cleaning and sanitizing Daycare facilities daily, scooping all stools, communicating with clients via daily report cards, assisting in Daycare Evaluations and more. Daycare Counselors must have a passion for animals and a good understanding of dog behavior and pack dynamics, including breed specific behaviors. Meadowlake prefers 1-2 years experience in a boarding or daycare facility. The Groomers are responsible for maintaining a safe, clean and healthy environment in the groom shop, meeting individual grooming department goals and ensuring that all pets receive a professional quality groom, and/or bath, that exceeds customer expectations. Strong customer service skills, a passion for animals and a focused attention to detail are required. Meadowlake also requires at least 2 years experience working in a professional groom shop, a thorough knowledge of breed specific cuts, ability to handle all size and breed dogs and exceptional communication skills. The Bathers are responsible for assisting the Groomer with providing an exceptional bathing experience for pets with scheduled grooming services. Responsibilities include bathing, towel or blow dry, nail clipping, ear cleaning and performing additional spa services such as blueberry facials, Furminators and more. Bathers must have a passion for animals, a desire to work in a fast paced, team environment, excellent communication skills and a knowledge of proper animal handling techniques. The Trainers are responsible for providing dogs with effective and productive training sessions throughout the day focusing on the client's individual goals. Trainers must document sessions and report results and progress back to the Training Manager. A thorough understanding of behavior, AKC groups, various training tools is required. Applicants must have a positive attitude, good time management skills, excellent communication and the desire to learn.